This world seems to tell us it is all about the money. Certainly, I need money, too. I need money for rent, food, clothing and phone and electric bills, and sometimes I also need painkillers for headache. I do not need much but at least some money as everyone else. But is it all about the money? As an artist I asked myself: from where does an artist get money, how can an artist make money? The answer came in to my mind: by making money there is a chance to get money in the artist´s own bank account. So, my goal was to make money. 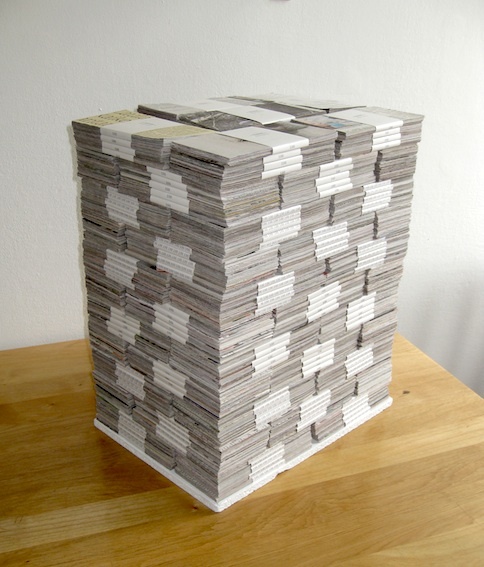 I spent five weeks gathering and sorting newspaper; cutting them as notes and bundling the notes together. Eight hours every working day and totally 200 hours. The price of the artwork was based on the costs of the used materials, the rent of studio, the travelling costs and artist´s fee. And because Worth its Weight was for sale in a sales exhibition a commission was also included. The total price of the work became as much as 3415€. All together, there were about 1 700 bunches of notes and each bunch included 100 notes. 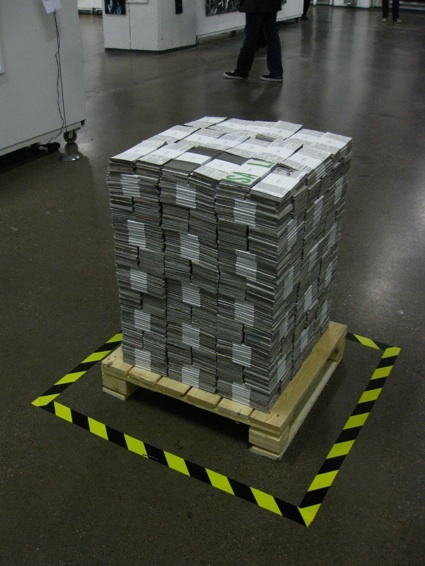 The weight of the notes was 99 kilograms without the palette on which those were placed. I made money by myself but it did not turn into numbers in my bank account. No-one bought my work in the exhibition. After the show I packed my work in cardboard boxes and now I store them in our cellar. But, I do not want to store those there forever and waiting the day when the storing costs have grown higher than the value of the original price of the work. There would not be any sense at all. Secondly, I have also considered that this planet is already quite full of everything and do I want to be one of those who will produce more that everything. 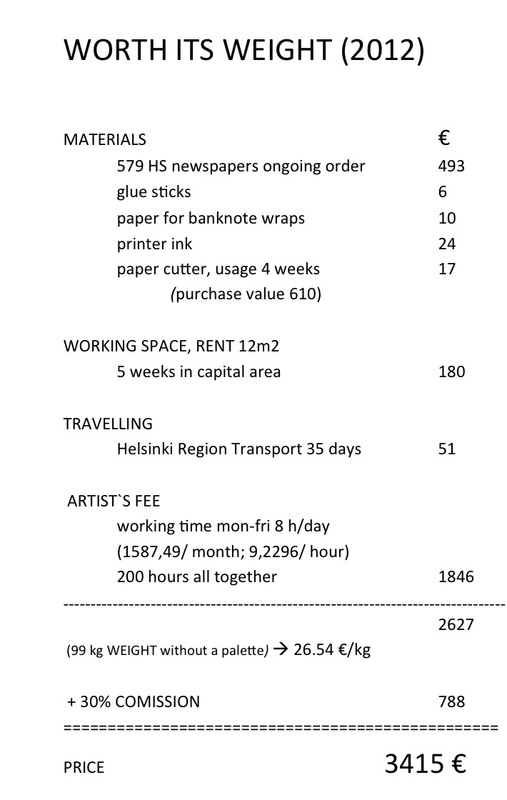 The second stage of the project Worth its Weight was November Market Happening (2012) also in Cable Factory, Helsinki where the artists who work in there could sell their art work or something else. The following text was printed in a small leaflet and leaflets were attached to every package. “This package is a part of a project Worth its Weight, which is researching a human, money, art and a city and their relations to each other. 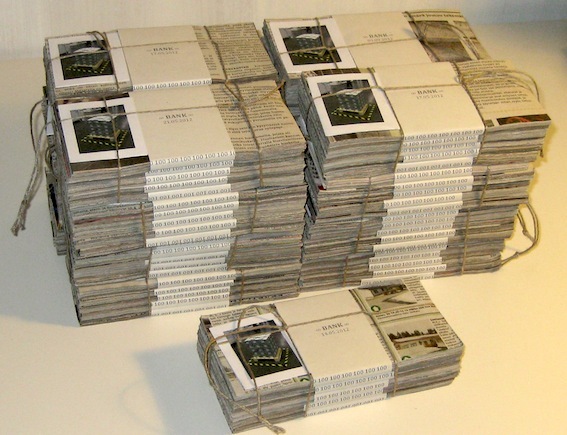 The first stage of the project was about 1 700 pieces of note bunches, made of newspaper. The artwork Worth its Weight was shown in Cable Factory, Helsinki in Art Fair Suomi 2012 sales exhibition. Also this package and these bunches can be approached as art, at least it is made by an artist who has a MA degree in Environmental Art. Tree of these packages were sold as a price of 5€ of each. My customers were my friend´s mother and my former teacher. 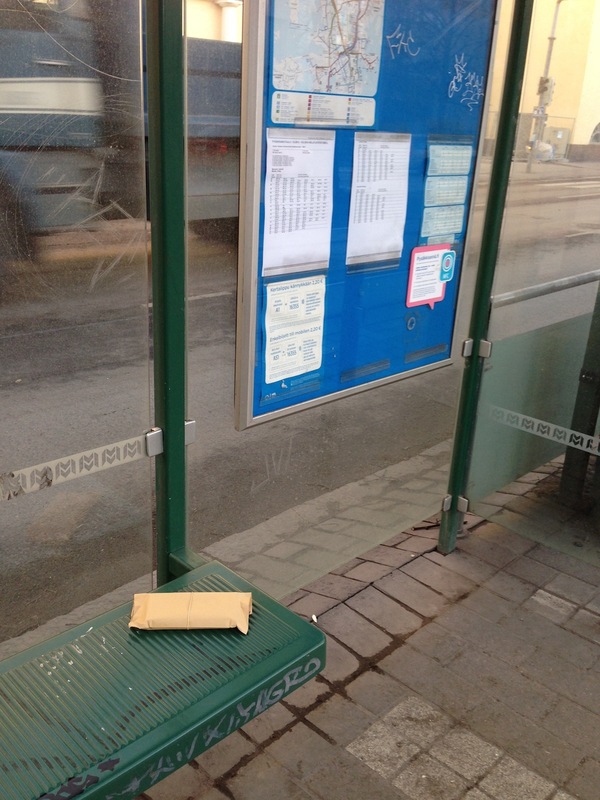 Totally, I got 15 € for packing the packages, writing and printing out the labels, carrying them by tram to Cable Factory and sitting behind the booth for six hours. However, the time run fast, I was there with a friend and we had nice talks. A nice day, having art as a hobby. The FITAX500 will take place at MUU gallery (Artists’ Association MUU) on Monday 27th of May 2013 and I have been thinking to participate with my work Worth its Weight vol. 3. I will separate some note bunches and build an artwork which is worth of 500€. The price of the work per kilogram is 26,54€, so I´ll need 325 note bunches for it. The total weight of the work will be 18.84 kilograms. That event was successful for me. Today I do not have those 325 note bunches anymore. Instead, I am an owner of an art piece which is not made by me. Tax Refunds Paid 2013 started on 4th of December. At first this project was going to be valid until 24th of December, 2013, unless the money does not run out before that. A few days after the start I realized the amount and the weight of the deliverys and the plan seemed impossible within the time frame I set. So, nevertheless the earlier plan the offer will be valid until I do not have anything to refund. Each envelope is wrapped with a rubber band and contains three (3) note bunches. Each bunch consists one hundred (100) notes.